....I might think the groundhog (why are those overgrown rodents a recurring theme in my life????) was wrong. Perhaps because I am just enjoying the comparatively mild temperatures the last week. Could be the garden show - www.midatlanticgardenshow.com - going on this weekend that I fervently hope to get to. Maybe it is all just wishful thinking, but it certainly feels like spring is around the corner. Nature has been tossing out little gems for me to gaze upon, tempting me outside again. As I sat here typing, outside the window 2 red tail hawks and a large crow were dipping and diving in some form of combat. There are things happening out there. Sap is rising. This appeared down the road the other day! The first baby of the year. They usually have 3 or 4 little colts each spring, but it is quite early. This little one is SO tiny! The women folk around here all squeal with delight when we see them, driving the guys crazy. It's becoming a sport :-). The lemon thyme is putting out fresh leaves. We always seem to have some fresh thyme, but I noticed how lush this looks. Of course those leaves are way smaller than they appear in the picture, measuring no more than 1/4" each in length. I've talked about the mountain mint that grows here. It was a little slip that came home from Baton Rouge with me, and now it is quite a large, healthy patch. It is spreading vigorously with underground runners. I am becoming a bit alarmed. May need to move the berries. The beautiful gray sage is a marvel to me in the winter. As harsh as the weather is, the plant continues to push small leathery leaves. Really a stunning plant! When it warms up a bit I will trim it way back to get rid of the "legs". Finally, what we laughingly call the "terrorist cell" of roving chickens. There are about 6 of them, and that rooster is the ringleader. He's a beauty, by the way, with a big ruffly buff colored neck, and tail feathers that shine in every different color of the rainbow, depending on the light. The rest are mostly hens, with one other rooster who thinks if he hangs around...well.. you know. They come up each day and scratch around in the mulch. When they hear a door, they take off for the trees. When a hawk flies overhead, they are in the trees faster than I'd have thought possible. They react very quickly. So at any given time, there are roosters crowing from all different directions on the farm. A lovely cacophony. For the week between Friday, February 27 and Thursday, March 5 you can enter simply by entering a comment in response to this blog entry and take a chance at winning a full year's subscription to The Essential Herbal Magazine! The Essential Herbal is written by, for, and about herbie people and the things they love. It is a grassroots publication that talks about the things you want to know when it comes to herbs. The following blogs are also participating, so stop over to enter with them for additional chances to win AND the chance to explore some cool blogs. If you are already a subscriber, we"ll just add the free year on the end. Be sure to leave an email addy in your response so that we can reach you if you win! *** These blogs will be having contests for the next 10 weeks. Be sure to come back! Entries are closed for this contest. Will announce the winner and put up next week's contest in the am - come back and enter again!!! There are a couple of things we've used here in the past couple of days that are interesting. Our mother started carrying it with her because she had a disorder that sometimes caused her throat to spasm when she was eating, preventing her from swallowing completely. The Rescue Remedy helped quite a bit in that case. She fell in a restaurant once, and was shaking uncontrollably. She took a dose and watched as her hands stopped shaking almost immediately. Flower remedies are made with the energy and essense of plants. It is along the same vein as homeopathic remedies. We are currently running a series of articles on creating your own essences by Kristena Haslam in The Essential Herbal. In any case, the kids were thrilled to have a remedy for their stage fright. 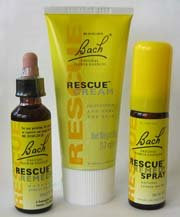 The Bach Rescue Remedy was a huge hit. Bach Remedies can be found at herb shops, health food stores, and on-line. Some progressive pharmacies also carry them. Next up - the loathing. I am getting too old to be carrying so much extra weight. It's gotta go, and so I'm trying some things that may or may not help. 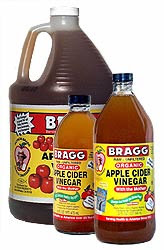 I've heard that good, apple cider vinegar encourages weight loss. It is also said to assist with digestion - like indigestion, heartburn, and reflux. I once listened to a lecture by David Winston, and he talked about the idea that instead of stopping the production of stomach acid to cure those problems, we in fact need MORE acid. I've wondered about that too. It seems that food stays in my stomach forever sometimes. So anyhow, I decided to try the vinegar. Oh. MY.. GOSH... that is some wicked stuff. I think the first time I tried it straight. Don't. Ok? Just don't do that. Next, I tried using a shot glass. One T vinegar, topping it off with water. Only slightly better, but possible at least. We discussed this a bit on magazine Yahoo! list this week, and I am now mixing it with honey, water, and a little juice. And guess what? I LIKE it! It tastes great! The real surprise is how it makes me feel. A while back we drank kombucha for well over a year. We brewed the tea, pampered the babies, massaged the mothers, and shared the scoobies. We always said that the drive and determination to open our shop came from kombucha. The vinegar feels a lot like that to me. Lots of energy, lots of confidence and an overall feeling of health. Apparently I DO need more acid. A couple of words of caution: Never, never, never use distilled white vinegar for such a thing. That is really not for internal consumption. Save it for cleaning. Use ONLY good, live-with-the-mother apple cider vinegar. A few people also said that they knew people who drank too much and seriously injured themselves. Two people wrote in attributing deaths to drinking vinegar, but I strongly suspect that the people who were drinking it were doing so because they were already seriously ill. I am taking 1-2 T per day, diluted. I KNOW that there are other people who can relate to this.... Do you ever settle at the end of the day and think to yourself, "Was that only this morning? Seems like about 3 days ago!" Some busy days are like that around here, when you do many different things that would sometimes BE the whole day. Yesterday was one. Heck, just suppertime was one! Lately I've been spending my Wednesdays at Radiance. It's nice to work a day away from home each week. Gives me a reason to wear something other than t-shirts. We (Sarah Campbell and I) also are doing lunchhour workshops from noon to 1:30 each week, and that's fun too! Yesterday was a tea blending workshop. The table was set with an extraordinary array of ingredients, utensils and pots from which to sample. We had heat-sealable teabags and a handy iron to seal up the blends the participants blended. Afterwards we enjoyed our own lunches (along with co-owner Kara) at the table, sipping "Love Your Liver" tea made with yummy roots, into which we'd added a pinch of echinacea to combat some of the yuckies going around. During the day the weather was just a messy, grumpy, gray mess. Snow, sleet, rain, and dark skies. Yuck. When it was time for me to head back up the hill, I could see the ice freezing on the road, and there was a cold fog moving in. Part way home, I turned around and chose a different route in order to avoid a steep and windy hill that I knew hadn't been treated (and sure enough, the cinder truck passed as soon as I got home). It was so good to get home, and I anticipated settling in for the night in some cushy sweats or even maybe pajamas. But it was chilly. At first it seemed like maybe the bug going around bit me, but then upon picking up a ceramic mug, it became clear that the air was COLD. Looking at the thermostat, it quickly sunk in... the furnace wasn't working. The first call is always to my sister's husband. All of the younger siblings consider him a big brother. We were just talking about it the other night, and once again that proved true last night. While we were on the phone, there was a *beep* on the line. Molly's truck wouldn't start, and she was in town. All worked out ok - nephew Rob went to rescue Molly. The furnace guy was here til 11 last night, and with any luck we'll have heat again this afternoon. Hmmmm. How many days does that seem like to you? I'm going to stick with three. The newest issue of The Essential Herbal magazine is in the mail, heading to eager subscribers so now there is a moment to post the cover and table of contents here for you to peruse. If you've never seen the magazine, there is a link to a free pdf of a back issue to check out over there >>>. 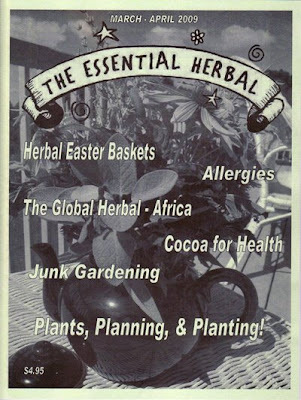 The Essential Herbal is a print magazine that comes out every 2 months, written by, for, and about herbie people and the things they love - HERBS! Although it is mid-February, we're having a temporary thaw here. This new issue is spring-y and has the feel of a new season in the garden all over it! Some of the suggestions that we got notes about have already been implemented. The crossword puzzle has been made easier to read, there is an article focusing on the herbs of one region of the world (and that will be a series), and we also have something for the people who were looking for herbal gift baskets (Easter baskets this time)! I am extremely happy with the way this issue came out, and think you will enjoy it too! Field Notes - what is happening to herbalists right now? Cocoa for Health, Cindy Jones... that's right, it's GOOD for you! Flower Essences Part 2, Kristina Haslam... learn to make your own flower essences with this series. Beautiful Benjamin, Gale Lascala...a kindred spirit who loves the wild native spring flowers. List Article...What would you most like to learn about herbs? Down on the Farm, Mail-order Herb Plants-Garden in a Box, Michele Brown & Pat Stewart...the care and feeding of plants that arrive in the mail. Spring Time Herbal Healing Checklist for Allergy Sufferers, Cory Trusty...Learn to calm allergies with herbs. Separation Anxiety and Stress - not just for Humans Anymore! by Kathi Garrison... help for lonely pups. It's all in the Planning, Susan Evans... getting ready to start a new garden requires thought. Planning the Herb Garden, Mary Ellen Wilcox... a different take on beginning a garden (with recipes). Dandelions & Lightningbugs, Jill Beebout... A tale of the moon and the sun, and how they share the sky. Beeswax - White or Yellow? by Marti Graham... The difference between grades of beeswax. Getting to Know Your Soil, Pat Myers... Loam? Peat? Limestone? Pat explains and tells you how to fix yours. Herbal Easter Baskets, Betsy May... Lots of great ideas for the friends you'd love to gift this spring with a basket of goodies! Louisiana Lagniappe *see below- Herbed Shrimp Salad in Avocado, Sarah Liberta... mmm, MMMmmm. The Global Herbal - Africa, Marita Orr...Herbal wisdom from around the globe. Adventure in Junk Gardening, Barbara Will...Barb takes one person's junk and turns it into treasure. Strawberry Drinks, Maggie Howe... A selection of delightful, refreshing beverages. The pure, clean flavors of fresh herbs and a touch of lemon juice accent the taste of the sea in this perennial favorite. The Jerusalem artichoke adds a sweet, smoky surprise. Put 1 Tbsp. olive oil in a small skillet. Add onion and celery, stirring until they begin to wilt. Add artichoke, season with salt and pepper, and sauté about 3-4 minutes. Set aside to cool. Split avocados and remove pits. Use a large spoon to remove the flesh without breaking the shell. Coarsely chop avocado, place in a large bowl and toss with lemon juice to prevent darkening. Set aside 4 whole shrimp; chop the remainder into bite-size pieces and add to avocados. Add cucumber, tomatoes, onion, celery and artichoke. Coarsely chop herbs and add all but 1 tsp. to the bowl. Salt and pepper to taste. Drizzle with vinegar and oil. Toss to coat all ingredients. Mound 1/4 of salad into each of the avocado shells and arrange on 4 plates lined with lettuce leaves. Top each portion with the reserved shrimp, remaining herbs and garnish with edible flowers. Was That a Train Landing? My sister and I were talking about the wind last night. Although our houses are visible to each other, she is in a valley and I am on the top of a hill. There is always a breeze at my house. Weather is more apparent to me. So when we were talking, I said, "it sounded like a train landing...and that was NOT a mixed metaphor." It was with great amazement that upon inspection this morning, the only thing I found was a roof shingle on the front yard. Unfortunate, but not unusual. The funny part of this story - at least to me (and my sister was highly amused as I shared it with her) revolves around the remedy I discovered last year for the groundhog family undermining the front steps. They were a very stubborn group, reluctant to leave that particular tunnel system. We tried a lot of things - both gentle and not so gentle... some downright diabolical... but still the groundhogs remained. Some of the shrubs in the area died (note: shrubs do not do well when doused with peppermint oil), but the groundhogs continued eating my perennials and digging away under the steps. Eventually someone told me that they don't like noisy surroundings. AHA! I stuck up some windchimes near the hole. They either began hibernation early OR they've moved on. I am quite certain that they are out there procreating as I write, as they are mutants and indestructable. The thing that seems sort of funny is that the wind chime is right outside my bedroom window. It was so lovely in the warmth of summer. The constant gentle breeze on the hill allowed for an ongoing chiming background that made me smile on those occasions when I was even aware of it. In the fall and winter, the chiming let me know when there was "weather" going on, sometimes awakening me to check before sending the young'un out unaware into icy conditions. It's all good, right? Until last night. I've gotten used to living on a windy hill. It took a couple of springs, but I'm ok with it now. The sound of wind trying to rip off siding and shingles is no biggie. The gusts that shake the house and rattle the windows are no longer frightening. However, last night the wind chimes sounded like perhaps Zeus was pounding out some armor. Every so often the wind would die down for 30 seconds or so - long enough for me to doze off - only to rise again with a resounding clanging and banging. It was an astoundingly loud night. I can hear the groundhogs laughing, off in the distance. Here, you can see the furniture on the back deck. Some of it is still standing, so this is not the worst wind we've seen. So, my tenacious little friends the woodchucks will once again get some of my attention this spring. I'm already plotting. The wind? That's just life on the hill. The last month has been particularly brutal. It may be age, but it has been difficult to get warm enough, and for the first time in memory, I've been thinking how much better the hot weather will feel. Everyone is different, and generally I prefer the cold. I like to think it preserves me. This weekend brought a couple of lovely days in the 50's. Brilliant blue skies, and fresh air were just impossible to resist. We had mountains of work to do, and most of it got done (or will in time). The magazine will be shipped tomorrow. We weighed 19 batches of soap, and the fats were darned near frozen! We need to find a way to store the pallets in a warm place. It is amazing how hard frozen fat can be.... We pulled and started wrapping a couple of wholesale orders, and I even put some work into the word puzzle book while unwinding during the evenings. There is still ice on the pond that leads to the path into the woods. It is starting to melt and there are places on the tip of the ice's surface that send out cracks where it is weak and getting ready to break apart. I wonder if that is because it is deeper there. The path winds along beside the creek. There is a wee bit of ice clinging to the edges of the creekbed, and almost nothing is green save for the chickweed and garlic mustard. Occasionally there are some emerald ovals of honeysuckle or a random rosehip. There are many, many deer in the area, so they've picked the briars clean. We will be planting more food this spring in the form of native shrubs. This log (and ONLY this log) was covered with these little puffball/galls or something. I assume they were a fungus of some sort. This was across the creek from me and there wasn't a good access nearby to cross without getting soaked. At this time of the year, the textures of the trees are really striking. There is a good bit of diversity in the woods, and at least 10 varieties are represented. Probably more, but I haven't really thought to count them in the summer. Hmmm... there's a project. It isn't as noticeable in the spring and summer when we are busier looking at the lush greenery. Now, in the starkness of winter, the beauty of the barks is clearer. I leaned up against a tree and looked up. The wind had all of the trees swaying and it was hypnotic. After a while, I realized that many of the trunks in the thinner trees were also swaying - and the ground is very soggy. That was a bit unnerving! This prehistoric looking, shield-shaped creature is a stinkbug. They are one of the most prevalent (ok - aside from the flies!) bugs around, and they just want IN my house. A live one plopped onto my stove the other night from heaven knows where. I've never seen one in this color stage before. They are typically the color of the dry leaves surrounding this one. Grayish brown. They really look un-real to me when they are older... like transformers or armored tanks with legs. At least this one looks like a bug. Upon my return, these chickens were somewhat indignant to be disturbed. They gave me a good talking to as I entered the shop to continue with the weighing of the fats. They like to dig shallow indentations right up against the foundation to stay warm, and the sun hits that side of the shop all day long. Later, the moon rose as I was finishing up dinner on the grill. This shot is deceptively dark. It was still very light out, and directly behind me on a level with the moon, was the sun. It was a beautiful end to a spectacular day. This picture cracked me up. The guys at the printing company where we get the magazine done read the back page regarding an offer for subscribers, and took us up on it. Even though Barry doesn't fulfill all the requirements, how can you not love that kind of spirit? Shawn snapped the picture with his phone. Awww... you guys.... <3!!! The printing company happens to also be where I worked when the magazine was a wee babe, and is actually how I was able to get her started with nothing but good friends and sweat. It was a fun place to work because there were fun people to work with. One of the things I hear most often is that when you work for yourself, most people think that means you really don't work. Over the years, my friends have evolved into a group of *mostly* self-employed people. Last year when my brother moved in, he told anyone who would listen about how, "Tina plays on the computer all day!" As it was back in the days of the herb shop, the whole idea is to make it look easy. Nevermind that I was working by 7 yesterday morning and finally decided it was time to stop last night around 11. Sure, sure... I did take a couple of breaks in there to cook meals and then there was that other break when I looked at a potential website upgrade, but for the most part, it was all work, all day. Luckily I DO love what I do. But I never miss a sunset. First, I mentioned in my post about the February Customer Appreciation Drawing (yeah .... I like that name!) that we'd be putting out a book with word puzzles. That's one thing we're working on. Making a post about it and putting a deadline to it really helps get things done around here. I do that to myself all the time, and will nearly break my neck to fulfill a deadline. After all these years, at least I know how to get myself to finish. The publication will be filled with all sorts of herbal word puzzles, and aside from the herb/word nerds, we will expect that herb groups and businesses will copy them for distribution (singly - not the whole book! ), keeping our contact information intact, of course. I know we would have loved such a thing back when we were doing weekly classes and putting out newsletters, etc. at the shop! OH! I got a box from Sun Rose Aromatics the other day, and it was like a treasure chest! I really just wanted a bottle of Ravensara aromatica for any germs that got into the house this cold and flu season. But that website is so full of wondrous, precious items, it is hard to leave. Very hard. To begin with, I've been looking for these little Japanese (I think they're Japanese...) charcoals for burning incense. I prefer them to the large coarse round ones that are more common. These SEEM expensive, except that when you figure out how many there are in the box and how wonderful they are... it is well worth it! I got a couple of resins... Elemi, which I'd never tried, and Copal - both from Manila, ethically harvested. Both are amazing! The Ravensara is (of course) deliciously anise-like in scent. I've always enjoyed it, and my brother (who it is really for since he can't have alcohol based extracts or tinctures), loves the smell while he can't stand the scent of the star anise I was working with yesterday. Me thinks he is toying with me. There was a bottle of Rosalina - Melaleuca ericifolia which is SO much nicer than other melaleucas. A little research will be going on here, but I just love this stuff. There is a bottle of "Breathing" - a blend of essentials that clear the sinuses, and Roe sent me a bottle of her Root Chakra Balancing blend (LOVE the vetivert and spikenard! ), and another wee bottle of Kunzea ambigua, which was accompanied by some information regarding its properties as anti-inflammatory, anti-infectious, anti-microbial, and anti-stress! What an amazing oil! She always slips a gift into an order, making it even more fun to get that box. Susan W from CT ordered a renewal on the 19th of January, automatically making her an entrant. Her name was drawn last night making her the winner of a Herb Beads book, and three vials of the Botanical Bead Powder! And now, all orders placed in February will be placed into a drawing for.... drumroll please.... the Herb Word Puzzle booklet that we're putting together right now! We have about 25 puzzles already put together from over the past several years. We'll pull together some more jumbles, word finds, and crosswords, and put them all together in one place. The winner will most likely receive the very first copy :-). So if you're an herbie word nerd, jump right in! Order a subscription, renewal, back issues, books, any of our products - and get yourself in the running!